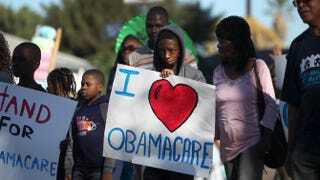 Supporters of the Affordable Care Act march in the 29th annual Kingdom Day Parade on Jan. 20, 2014, in Los Angeles. It’s no secret that we’re witnessing a reverse black exodus to the South, forced by recession, gentrification, reconnected family ties and hipster racism. Yet while three-quarters of black population growth in the U.S. is happening in the heart of Dixie, the health care numbers show a different story: It’s also home to the highest rates of uninsured African Americans in the Affordable Care Act era. There’s little doubt that the Affordable Care Act—permanently Etch A Sketch’d into “Obamacare” by Republican messaging wizards—has done what it set out to do. In terms of pure numbers, fewer folks are uninsured, and even fewer critics who danced around the rollout fail can point to actual flaws in coverage. In 2014, half of those newly insured secured insurance through an exchange, according to Gallup. And rather than fight over whether or not the health care law is a success, the New England Journal of Medicine and the Commonwealth Fund quibble over whether it was 9 million or 10 million people who got insured in 2013. But even though they’ve been among the biggest supporters and beneficiaries of Obamacare, a newly dropped Urban Institute (pdf) study suggests that African Americans are still the least likely to enjoy the shrinking uninsurance gap. Why? Because blacks are concentrated in the states least friendly to the ACA, places where stubborn Republican governors have pretty much flipped their finger at a sorely needed Medicaid expansion. That’s a big problem, since nearly 55 percent of African Americans are living in (and eagerly moving to) five key states that still won’t expand Medicaid: Florida, Georgia, Louisiana, North Carolina and Texas. That’s not even including other non-Medicaid-expansion states, like Alabama and Virginia, for example, where blacks constitute anywhere from 20 to nearly 30 percent of the population. It’s a political wrinkle that finds 11 percent of all African Americans still uninsured—even when they’re 14 percent of the total U.S. population. Bad enough that 20 percent of all blacks nationwide were uninsured before the ACA took effect. Clemans-Cope is quick to note that black coverage has risen by 5.2 percentage points from 2013 to 2014. But if all 50 states and the territories expanded Medicaid, there would be a massive 21 percent increase in the number of African Americans covered by 2016. Right now, 11 percent of blacks are uninsured—but expand Medicaid in every state and that number drops to only 7 percent of the black population. While Florida Republicans are showing signs of buckling in favor of a Medicaid expansion—perhaps in large part because of Gov. Rick Scott’s (R-Fla.) uncomfortable, skin-of-his-teeth re-election win—other Southern cradles, like Alabama and Tennessee, are slowly expanding. Virginia’s Democratic governor, Terry McAuliffe, wants an expansion, too. But that’s a tough sell when pitched against Republican majorities in both the state’s House and Senate. And with Virginia Republicans poised to ride another anti-Obamacare wave during 2015 state legislative elections, there’s no chance Medicaid expansion will see the light of day. Ultimately, Republican politics will determine how many more black folks get health coverage. The five big states named above are all dominated by Republican governors and solid GOP statehouse majorities. Two of the states—Louisiana and Texas—are currently run by ambitious Republican pols Govs. Bobby Jindal and Rick Perry, respectively, who famously flirt with 2016 presidential runs. They will reject Medicaid expansion at all costs if it gives them a ticket into the GOP’s very red-meat presidential primary process. Others quietly want the 100 percent federal reimbursement money if they expand, yet publicly whistle a different tune when stumping in front of largely confused white conservative audiences who need health care just as much as their black neighbors. Think about it: The five states above are among the most egregious voting-rights violators in the country. If they’re already taking away your right to vote, what makes you think they’re ready to give you health care? Some states could come around, depending on what kind of clout black political communities can leverage in future election cycles. But with voters of color barely paying any attention to critical state-level races, that’s becoming a hard ask. Who is up for re-election and who wants to be a player in 2016 will help predict whether a non-Medicaid state eventually flips.